What do you mean by automation? What are its benefits? It is basically a technique to automate the tasks and process with the help of customized equipment which rely upon technology. It is valuable for the associations to consider automation as it enhances capability and cut down the botches from a couple of business techniques and transactions. Moreover, the human interference can be avoided up to a great extent. Different strategies can be automated with the usage of specific equipment and expertise. What do you know about the common steps that are involved in Automation anywhere process? The very first thing is to select the test tool. After this, the next step is to describe the scope of automation anywhere followed by the steps planning, designing and development. Next step is Testing execution and the last step is maintenance. It is essential to follow the steps in the defined sequence to remove confusion. What are the important factors that must be taken care of while planning Automation anywhere? Before doing anything, the essential thing to concentrate is picking the Automation tool that is beneficial. It is critical to pay equal attention to the framework if it is accessible. The test environment setup is furthermore imperative to consider on priority. Another factor that matters a lot is recognizing the test Deliverables. Additionally, factors, for instance such as the timeline of the project and its execution are substitute factors that must be taken in the midst of the planning stage. Is it possible to use Automation Anywhere testing for agile method? What are the factors that can affect it? Yes it is possible. However in some cases, there are conditions in which it isn’t useful. The primary concern is a significant part of the time changing the necessities of Agile testing. In such a case, it isn’t possible to use it. Normally there is need of the multifaceted level of documentation. In such situation also the testing for agile method is not useful. However, in case of continuous integration, it is possible to use it simply. What are the automation tools you are certified in? It depends on you. You can indicate here about the tools you have good command or skills in. Generally, it is asked from skilled professional in the Automation. What are the features you would look while selecting a tool for automation anywhere? The tools must be simple to use and have test environment support available simply. It must have debugging capability for the smooth operations. It is quite true that testing image and objects are the vital aspects in the Automation Anywhere. Hence, it must have a better image and object testing skill. Also, it must be able to test the database. Object identification and multiple framework support are the other features that must be there in a tool for Automation Anywhere. Name any five things which you can automate? What factors are important to consider for scripting standard for Automation Anywhere Testing? For every ten lines of code, there should be three lines of code. Name any two important tools for Automation anywhere testing? Both of them are equally powerful and help to get results that are totally error free. What are the reasons for not considering manual testing in automation anywhere approach? The best issue is it needs a huge amount of additional resources and furthermore it’s a time-consuming process if done manually. There are certain chances of heaps that can declare their presence as a result of mistake. When projects are time constrained or when they are to an incredible degree far reaching, plainly obvious, it’s not a wise option to consider manual testing. It can degrade the performance of benefits performing testing as a result of losing interest by performing the same task again and again in a short time span. What do you know about the type of framework that is used in Automation Anywhere software? What do you mean by Sikuli? Sikuli is basically a significant tool in Automation that can be used when it comes to graphical user interface. It makes use of VIM method and holds several web elements. What are the uses of Sikuli? Sikuli is an extreme powerful tool that can be used for automating the blast objects, as well as websites. At whatever point there is a need of clear API, it can simply be used. Moreover, it can be integrated with different frameworks, such as, Java, .Net. Windows based applications can be automated fundamentally with the help of Sikuli. Moreover, it is possible to interface it with various tools, such as Selenium. Modern tools used in the scenario are able for this issue. The fact is automation softwares are well equipped with an error-handling mechanism to find the errors that often declare their presence. In case any manual action is needed, the same can be done by building logic in the system. 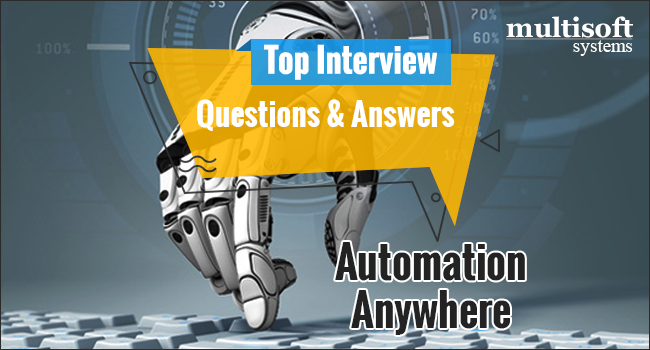 In Automation Anywhere approach, what exactly you will automate first? Modern automation softwares are fortified with one of the best features and i.e. they can analyze ROI and provide useful information on tasks that offer benefits and simply help in knowing what to be automated first. Obviously, this cut down the confusion that often comes due to the priority of automation. Recommendations from the employees in case of its operation in a business can also be taken so that complex processes can be automated first and employees’ burden can be reduced. What types of different systems are required for Automation Anywhere?? Since there is no necessity of back-end coding, any type of system can be considered. This is one of the leading benefits of this approach as well. What is Selenium? What do you know about it? Selenium is basically a framework for the test suite that is extensively considered in Automation anywhere approach. It is open source and can be very useful when it is about automating the mobile, as well as web environments. Its support scripting languages such as Python, PHP, Ruby, Java, Perl, and so on makes it one of the best framework. What do you mean by QTP? QTP stands for Quick test professional and is basically an Automation tool that is used in test environments. What is the purpose of Automation Anywhere and what are the challenges associated? Automation Anywhere is a decent approach that aims to save time and cut down the human mistakes. It is mainly a form of artificial intelligence that is helpful in making the jobs and processes more superior in every aspect. The biggest challenges related in the present scenario are skills shortage and sometimes cost. However, a lot of tasks can be made run without a break without worrying about their letdown. Both Sikuli and Selenium are powerful tools that can be used in Automation Anywhere. What should be paid attention to during the task creation? There are various methods available to ensure Automation is under control and is actually not wasting time, money and efforts. Task creation is mainly a useful approach that simply let the automation process work reliably provided you engaged only those in the processes who have good assistances. Is it possible to achieve 100% automation? Yes, it is possible to achieve 100% automation but generally extremely complex. Complete automation even has a lot of drawbacks too. Generally, it is not the primary target in any automation process and operations that aim the same is not considered in most of the projects based on automation. Name a few automation tools you heard about? Are all tools free? There are various tools available and not all of them are free. Selenium and JMeter are basically open source. The paid ones are Load Runner, RFT, Rational, DTP and Ranorex. Name the different recorders available in Automation Anywhere?